We know a great deal about the “founding fathers”, the famous patriots who fought for their freedom in the Revolutionary War. We know much less about the much larger numbers of Americans who labored as slaves, indentured servants, or apprentices. Benjamin Franklin estimated that at the time of the American Revolution, roughly one half of Pennsylvania's labor force was legally unfree—bound to someone else as property, for many years or for a lifetime. 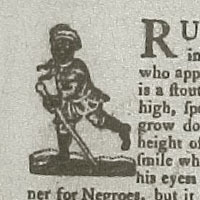 In this assignment we will use the online version of the Pennsylvania Gazette to build a database of information about runaways—those who sought freedom. Using this collected information, we will then try to draw useful conclusions about the people on whose labor the revolution depended.